Fountain Lakes most famous residents return in Kath & Kim Series 4 that also made the transition from ABC to Channel 7. Although receiving its fair share of flack because of the changeover, the series is still as entertaining and highly amusing as ever before. 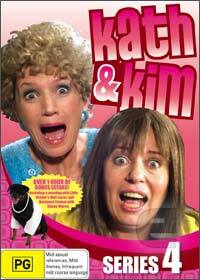 For those unaware of the Australian phenomenal of Kath & Kim, it revolves around a mother and daughter who reside in Fountain Lakes Victoria. Kath (Jane Turner) is the mother of the family who is married to Kel Knight (Glenn Robbins), a purveyor of fine meats or in laymen terms, a butcher. Kim (Gina Riley) is Kath's daughter in the series and is married to Brett (Peter Rowsthorn) who cannot keep check his womanizing ways in his pants. Joined by Magda Szubanski as Sharon Strzelecki, this series features every suburban Australian stereotype that makes the series so appealing to a wide variety of viewers. The creators have also upped the stakes of guest starts that include Little Britain's Matt Lucas as Sharon's sister and even Shane Warne who happens to play a Shane Warne impersonator. Even though this is the fourth season of the series, the stories and humour still remains fresh despite what some critics have said. Kath & Kim keeps on getting better and better. Once you have finished the series, you can then watch the highly entertaining extras such as "Stewpid Goofs" and Little Britain meet the foxy ladies. Definitely one for the collection with great video and audio quality, check it out!